In Conversation with Josiah Ober (Political Science and Classics, Stanford), Walter Scheidel (Classics, Stanford), and Caroline Winterer (Stanford Humanities Center, Classics, and History); moderated by Tyler Stovall (History, Dean of Humanities at UCSC). Join us for a scintillating conversation on the ancient principles of democracy, oligarchy, and dictatorship; on the Roman Republic experiment and its failure of Empire; on the implications of Ancient Greece and Rome for American intellectual life and its representative democracy; on the contemporary relevance of ancient Greek political thought and practice; on inequality in democratic societies; and more! Rush Rehm (Theater and Classics, Stanford) presents a special performance of Stanford Repertory Theatre’s Democratically Speaking. 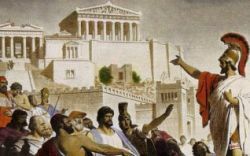 Democratically Speaking explores the idea and realities of “democracy,” from ancient Greece forward—a powerful smorgasbord of speeches, writings, and rubrics about democracy across 2,500 years. This staged reading with Courtney Walsh and Thomas Freeland features a timely exploration of “people power” (the root meaning of demos + kratos), a compelling challenge to all of us now.